excess fat tissue (abdomen, thighs, buttocks, arms), various forms of cellulite, unpurified and insufficiently oxygenated skin, abnormal excretion of toxins, water retention in the tissues (edema), loss of firmness and elasticity of the skin, low metabolism, slow blood circulation, after labor (not while lactating); while dieting, passive lifestyle. The treatment can be applied to the whole body or some of its parts, except the bust area, the recommended amount is 8-12 treatments twice a week, treatments can be performed in SPA capsules. Shower: Apply a small amount of Raspberry bath oil with Guarana Bio-Caffeine on hand/sponge and spread on moistened skin gently massaging. Use a sponge to enhance foaming. You can be apply the oil to a loufa (natural sponge) and gently massage the skin. Then rinse, dry skin with a towel. Relaxing bath: Depending on the size of the bathtub dispense the appropriate amount of oil, and pour into a stream of warm water (37 ° C), creating a velvety foam. You should enjoy a relaxing bath for about 20 min., additionaly you can use hydro massage devices. After the bath, dry the skin with a towel. Raspberry bath oil with Guarana Bio-Caffeine can be removed with warm cosmetic compresses. 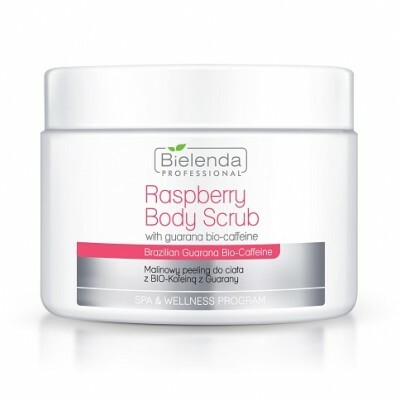 Apply Raspberry body scrub with Guarana Bio-Caffeine on dry skin (excluding the breast area), and massage gently in circular motions. Peeling intensity can be adjusted by the level of pressure during the massage. Remove the scrub with warm water in the shower or using wet compresses. Thoroughly dry the skin with a towel. Peeling can also be performed in the SPA capsule. Spread 2 in 1 Raspberry body concentrate with Guarana Bio-Caffeine evenly over the body and gently massage focusing on places with excess fat or cellulite symptoms until the product is completely absorbed. The concentrate can be applied with needle-free mesotherapy or sonophoresis (ultrasound) for about 10 minutes. NOTE! 2 in 1 Concentrate provides good conductivity of the ultrasonic waves, and prolongs the direct contact of the machine with the skin and ensures the machine runs smoothly on the skin. In addition, you can perform the classic or anti-cellulite massage using Watermelon Body Butter for Massage or one of Massage Oils. 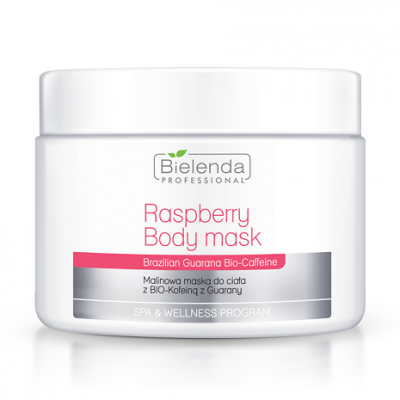 Next, apply Raspberry Body Mask with Guarana Bio-Caffeine . Using latex gloves apply the mask evenly to the whole body including the bottoms of the feet (avoid the breast area), or only to the selected body parts. Then wrap the body in plastic wrap according to the method of Body Wrapping or wrap the body in a plastic sheet. Body Wrapping should start from the ankle of the left leg, crossing the buttocks to the abdomen. Tear the wrap and perform the same process on the right leg. Use double-wrapping, adjusting compression depending on the degree of swelling of the body. Cover the body with a thermal blanket and a cosmetic blanket for 30 mins or use SPA capsule (sauna option) for 20 mins. The rise of temperature intensifies the working of active ingredients. Selecting the treatment with the capsule, the patient should be wrapped in the plastic wrap outside the capsule, and in the plastic sheet inside the capsule. The capsule increases the absorption of the mask. After 20-30 mins (depending on the kind of treatment) cut the wraps and rinse off the mask in the shower. Next, dry your body thoroughly with a towel. 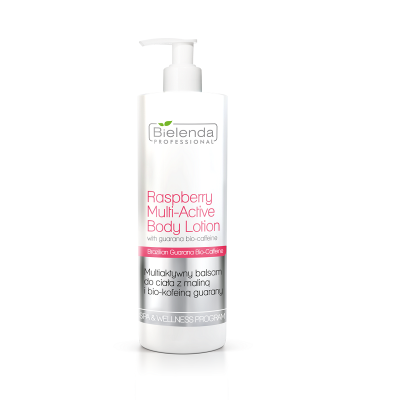 Apply a thin layer of Raspberry Multi-active Body Balm with Guarana Bio-Caffeine on the whole body, or parts covered by the treatment, and gently massage into the skin until the product is fully absorbed. Do not rinse. You can perform the anti-cellulite draining massage (depending on the skin issues). 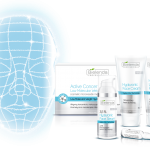 Professional skin care at home. The best results of the treatment are achieved when combined with balanced diet and physical activity. Patients with varicose veins or fragile blood vessels should not be subjected to treatment with the use of heat. The best results are achieved when the treatment is combined with lymphatic drainage or professional anti-cellulite massage.